• Residential building permits (smoothed) continued to increase and now stands at its highest level since December of 2007. Core manufacturing (nondefense, nonaircraft capital goods) orders, the Oregon weight-distance tax (a measure of trucking activity), and consumer sentiment all improved in May. 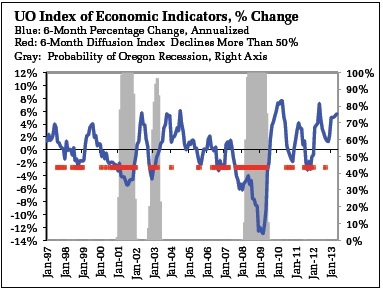 • Together, the two indicators point to sustained expansion in Oregon at an average to somewhat above average pace of activity. • The Oregon Measure of Economic Activity rose to 0.32 in May from a revised 0.22 the previous month. The three-month moving average, which smooths month-to-month volatility in the measure, fell to 0.16 where “zero” for this measure indicates the average growth rate over the 1990-present period. • The University of Oregon Index of Economic Indicators™ rose 0.8 percent in May; the UO Index has been rising or flat in each of the last 8 consecutive months. All index components have improved over the past six months. • Initial unemployment claims rose somewhat, but remain in a range consistent with ongoing job growth. Employment services payrolls, largely temporary employees, also rose during the month.